Ok, I’m sitting at my computer. In bare feet and sweatpants. Either way, I’m hella-humbled to publish a law blog, which the ABA Journal now recognizes as one of the best of all time. That’s right. 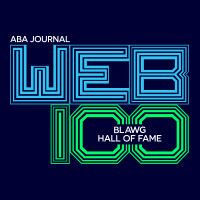 In addition to being recognized in the ABA Journal‘s Web 100: Best law blogs for 2017, The Employer Handbook has been inducted into the Blawg 100 Hall of Fame. Thank you, ABA Journal. Thank you to the other employment-law bloggers in the Hall of Fame who helped to pave the way: Jon Hyman, Dan Schwartz, Molly DiBianca, and Jeff Nowak. Thank you to all of the readers. Ah, who am I kidding? The readers that become paying clients are da bomb. My crew has tolerated way too much of my time spent on the computer typing these posts. And, all in the name of love and HR compliance. Thanks, fam. What’s next? Well, another blog post tomorrow. What else did you expect? Retirement? Those iPhone X’s don’t pay for themselves, you know.